Lying on the couch watching a good serie is one of the best things after a day of work, but when you do it everyday, it's not. Running is not only relaxing, but it's also very healthy! If you do it right, you can use running as an activity to lose some weight. But beware, only if you do it right. So you shouldn't run 6 times a week out of nowhere and only eat salads. It has to do with the right balance betweet running, nutrition and rest. When you run, you're putting your heart to work. Your heartbeat accelerates to pump more blood and thus also more oxygen through your body. When you're still a beginner your heartbeat will be a lot higher than when you're an experienced runner. That's because you're in better shape. On the long term, your heartrate will also decrease at rest and the growth of new blood vessels is stimulated. When this happens your blood pressure remains low or lowers. A lot of beginners go to the store and buy a watch that measures your heartbeat right away, but that won't be really helpful yet. That's because it's important to find out when you're having a tipping point. Your tipping point is the point where you notice that your breath is becoming heavier and you feel your upper legs becoming heavier as well. No worries, we won't bother you with a complicated story about how the human body responses to running. We'll get to the part of losing weight in a healthy way very soon. But before we do, we only have to go through a couple of steps. And running on your heartbeat is an important aspect of that. Specialists can calculate your tipping point or you can do this test at the gym. This test is executed by biking or running with a face mask. You can also test it yourself. The test goes as follows: you start by running for 6 minutes at the speed of 7 kilometer per hour and then accelerate 1 kilometer per hour every two minutes. 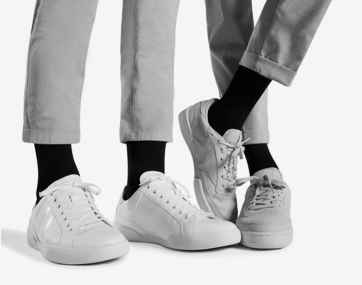 At a certain point you'll feel your legs getting heavy. When this happens, take a look at your heartrate. 90% of that is your turning point. The calculation is: maximum heart rate x 0.9 = tipping point. Now that you've calculated your tipping point, you can start running more consciously. There are five zones in which you can run. In the first zone you run on a very low heart rate. This can be seen as a recovery run. You are fully working on burning fat, but because you're running without too much effort, you're barely burning calories and therefore weight. The second zone in which you can run, is a zone where you can still talk very well. This zone is perfect for your mind. You're running without much effort and therefore empting your head. The ratio of fat burning and sugar burning is 75-25. Now we arrive at the most ideal zone for you to run in. In the third zone you burn 50 percent sugar and 50 percent fat. In this zone you're not just emptying your head but also improve your mental concentration. Your body releases several neurotransmitters that have positive effects on your feelings (that is, they make people happy). It provides the 'runners high' and you're losing weight. The fourth and fifth zones are for the real running junkies. This involves improving your time on certain distances or interval training. In these zones you'll burn a lot of calories, but mainly carbs instead of fat. Are you aiming for a better endurance? 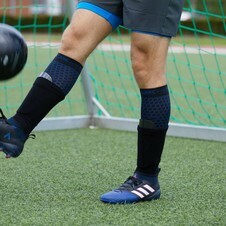 STOX Running Socks can help you tremendously. 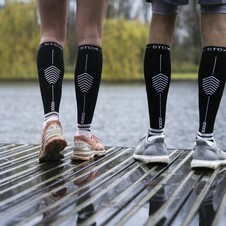 STOX improves the bloodflow back to the heart and reduces the residual waste in your legs. This allows you to perform for a longer amount of time and reduces muscle pain the next day. In addition, you're taking good care of your legs and you're preventing possible injuries like shin splints and the feeling of aching legs. 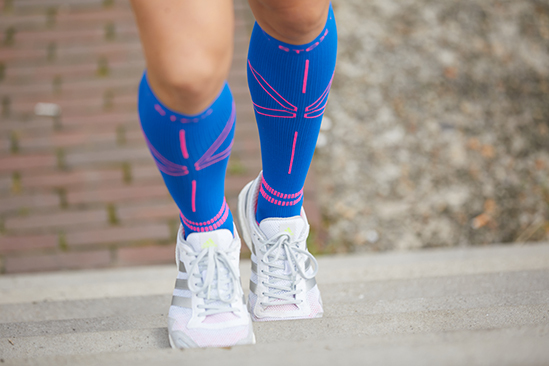 If you combine the Running Socks with the STOX Recovery Socks, you're going for the optimal run and an accelerated recovery process that allows you to start your next training faster. You're already doing a great job when you're running in zone three. However, nutrition also still plays an important rol in your training. For example, it's smart to go for a run before breakfast every once in a while. Your body will then immediately begin to burn fat. Getting tired before reaching 5K? Then your body doesn't see fat as an energy source, but carbs. You can train this by running a bit further everytime you go running before breakfast. Trust us, you'll become good at it. Your body just needs to get used to this. Are you unable to lose weight in this way? Then there are a number of disrubtive factors that can impede your journey of healthy weight loss. Possible examples are stress, too much snacking and exercising too intensively. Now you know how to do it, you'll be left with only one thing and that's actually doing it..